This blog receives quite a bit of traffic from the search engines, according to my Wordpress stats report. Sometimes it's obvious why certain key words lead to my blog; other times, it's mystifying. Many of the key words and phrases are amusing. Some are quite sad. So here's the first in an occasional series of vignettes reacting to some of these key words or phrases. Yesterday, a visitor searched for "Are layoffs via email ethical?" There are so few black and white answers in today's complex world. In my climb up the corporate ladder, I eventually learned that what looked to be a dumb decision or action by my superiors was often a good decision, informed by facts that were not at my disposal from my lower perch. So over time I learned to give the benefit of the doubt when I observed what appeared to be a dumb action by another manager or leader. Which is why you might expect me to say that there may very well be certain conditions under which a layoff can and should be conducted by email. I've been through numerous layoffs over the years, primarily on the winning side. I've seen all the shenanigans that take place before, during and after a layoff, by those whose jobs are eliminated, by those who are making the decisions, by those who are tasked with executing such actions. I have not seen, ever, in any context, a valid justification for conducting a layoff via email. Whether it's to manage legal risk, or to conduct unfortunate but necessary business processes with a dose of humanity, whether it's to maintain positive relations with soon-to-be-ex-employees who may one day hold a position of influence in the marketplace, or whether it's to minimize the inevitable confusion and communication gaps that result from email correspondence, there's always a reason to conduct a layoff in person. Perhaps a temp employee who's contracted on a day-to-day basis may expect to wake up each day to check whether she should go to work that day. But that's not really a layoff anyway. I challenge an accomplished business leader to make a case for why an email layoff is a better choice for either the enterprise or the impacted employee. But be ready with facts and figures. Because no matter what you say, you're wrong. 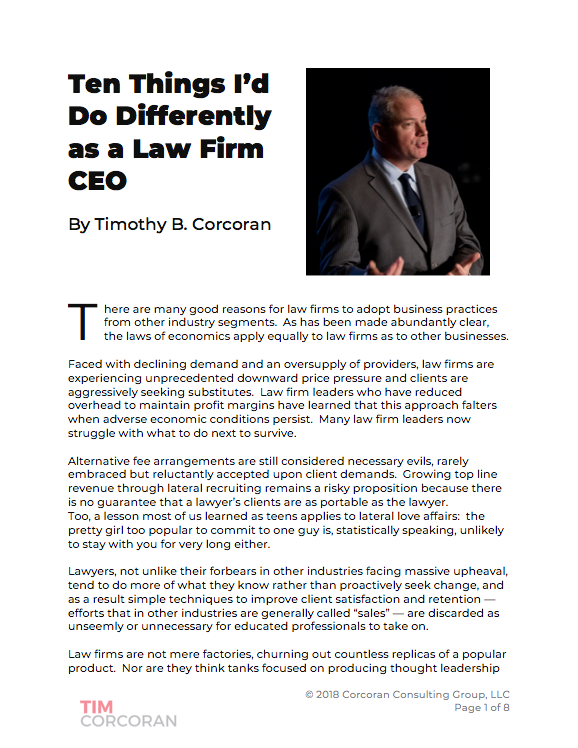 In a somewhat related post I wrote last year during a period when companies and law firms were laying off lawyers and staff nearly every day, I suggested that one can conduct challenging business affairs and drive change, and do so with compassion. I continue to fervently believe that's the case. Yet I've observed, and worked with managers who took a different path out of sheer laziness, incompetence or, more likely, sheer terror at facing the consequences of the decisions that are so easy for them to make behind closed doors. There's no reason to conduct a layoff via email. I can't speak to the legality or even the ethics, but by my standards, it's just not right.